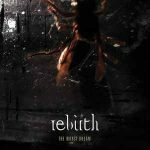 Background/Info: Mika Rossi, Jesper Nilsson and Anders Olsson are celebrating the 10th anniversary of their EBM brainchild commonly known as ‘Autodafeh’. 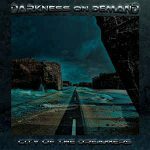 The band has released 5 albums and 2 EP’s and are actually working on their new opus planned to be released this year. 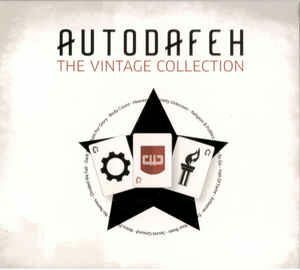 “The Vintage Collection” as the title indicates is a collection or compilation or simply a ‘best of’ album featuring remixed songs (by Autodafeh) taken from all their releases. The album features 14 songs while the vinyl edition only features 10 cuts. Content: Autodafeh definitely is one of the most recognized and praised contemporary EBM bands. The Swedish formation (also involved with Agrezzior) has been always been strongly inspired by the work of Front 242 and that’s an element you’ll rapidly notice. Every single song reminds me of a track from the impressive ‘242’ discography, but it has been adapted into an own approach. The songs are driven by danceable kicks, typical electro-body sequences, good-old spoken samplings and vocals in the style of Jean-Luc Demeyer and Richard 23. + + + : Autodafeh is to Front 242 what Spetsnaz is to Nitzer Ebb! You could say ‘a copyist’, but I think that would be offending the genius of Mika Rossi and his mates. The work is the result of great sound treatments, intelligent structures, carrying melody lines and the right BPM’s to get you into a frenetic dance. The shadow of Front 242 supports the entire work, but the composition is styled and more an ode to the Godfathers of EBM. I also want to say a word about the great vocal lines, which are also pretty ‘classical’ like for this kind of music, but still that efficient. The use of a delay and the backings à la Richard 23 are just great. – – – : Autodafeh has been never dealt with originality, but simply efficiency! I however can imagine some die-hard fans of Front 242 considering this kind of formation as pure blasphemy. Conclusion: If Front 242 is commonly and world-wide known and recognized as being the Godfathers of EBM, Autodafeh is one of the best odes a band has ever accomplished to this formation. That’s why this ‘best of’ is an absolute must-have for EBM fans. Best songs: “Exercise Your Brain”, “Divided We Fall”, “Retro Electric”, “Heaven Screams”, “Identity Unknown”, “Hunt For Glory”.